I met up with some friends at the Katsu-ya in Encino a few nights ago. While I've been at the Katsuya in Brentwood, I haven't been to the other ones so this Encino trip is a first. It is a decidedly different atmosphere than the Brentwood robata bar (although they are both loud). We ordered some standard sushi dishes, along with their specials of the day. All in all, I thought the sushi was ... so so. Maybe because we were not sitting at the sushi bar? 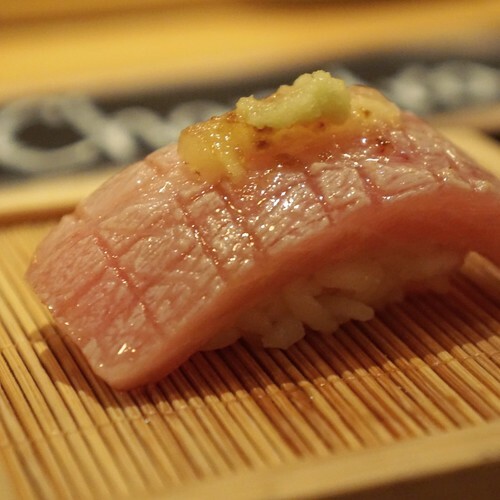 The yellowtail and salmon nigiri sushi were okay, but nothing special. The special dishes however (the cooked and marinated sashimi plates) were amazing and very unique/creative. The first of those was the seared foie gras with scallops (the scallops are hidden underneath the foie gras). This was a very good dish. 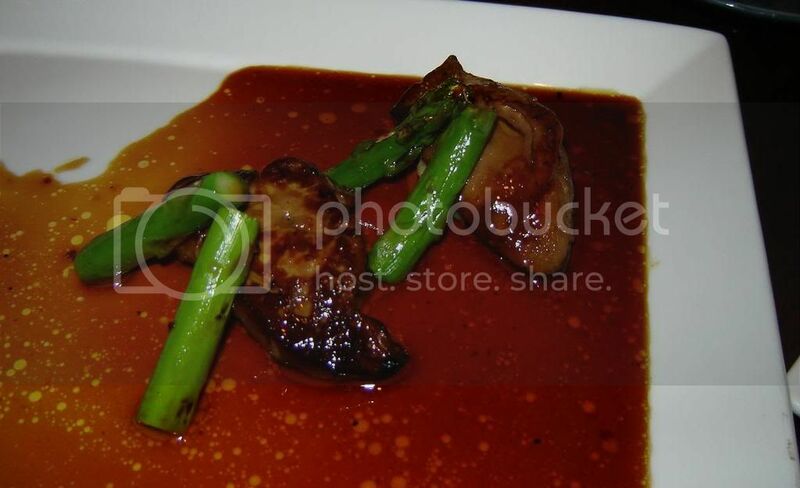 Not the best foie gras ever, but interesting and definitely flavorful. 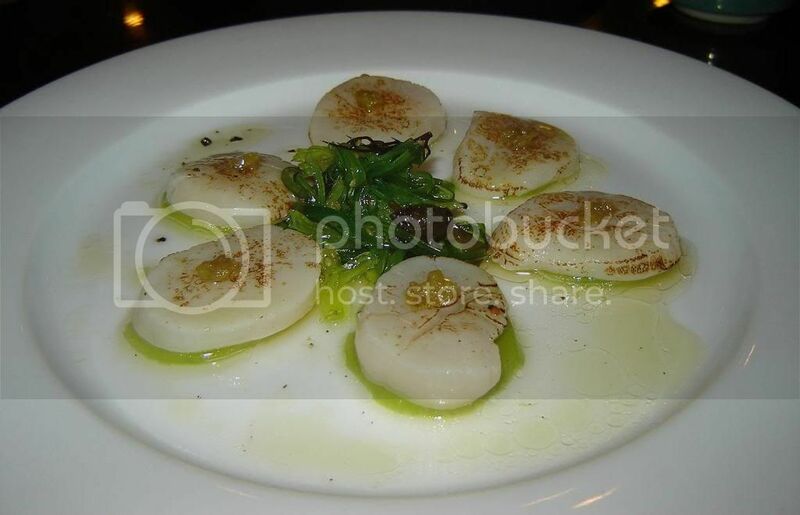 Next was the scallops and kiwi with yuzu vinaigrette. Who would've thought of putting scallops and kiwi together? I guess they did :) and the size even fit perfectly too. 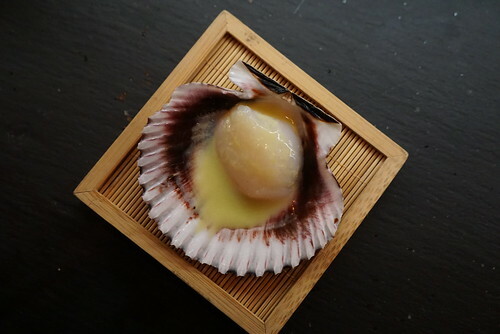 The kiwi goes very well with the freshness of the scallop sashimi, and the yuzu adds an excellent touch. 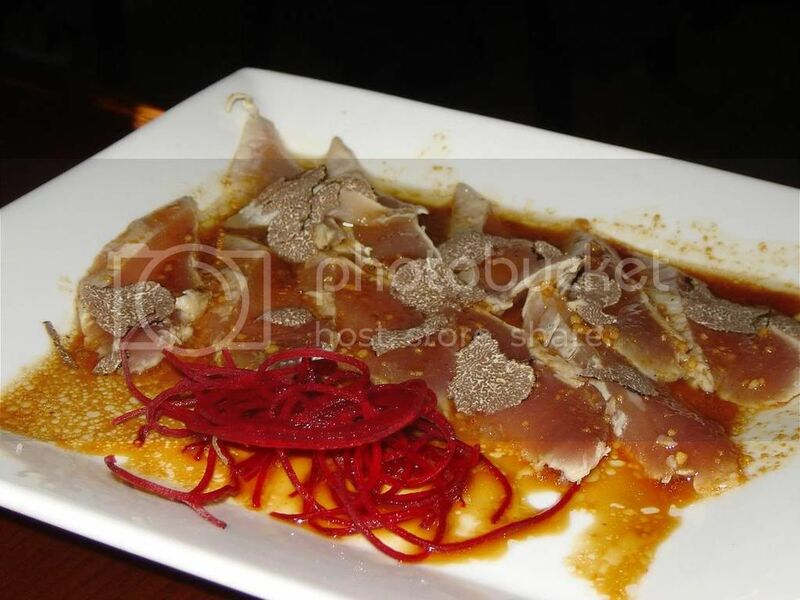 Then there was the garlic albacore with black truffles. They come and shave the black truffles tableside. 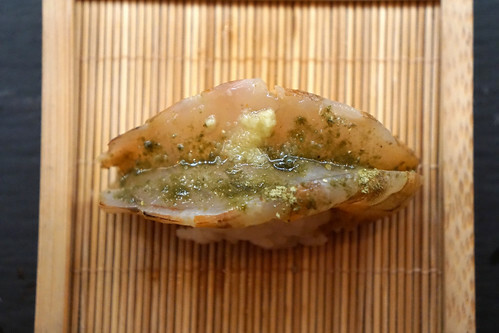 Garlic albacore was standard, good marinated albacore. The black truffles were aromatic and a really great addition. Also, not pictured (camera was giving me trouble at that point) was the baked eggplant. This eggplant dish was really really good! It had a unique flavour that we all went ga-ga for. The baked eggplant was stuffed with albacore and other various yumminess. 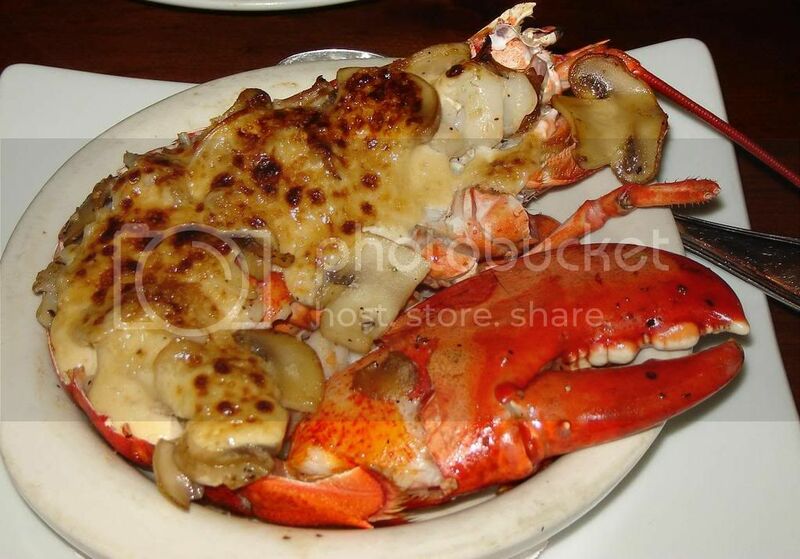 We also had the lobster dynamite, baked with mushroom. Very good lobster dish. I was not too crazy with the mushrooms, but all in all still quite tasty. 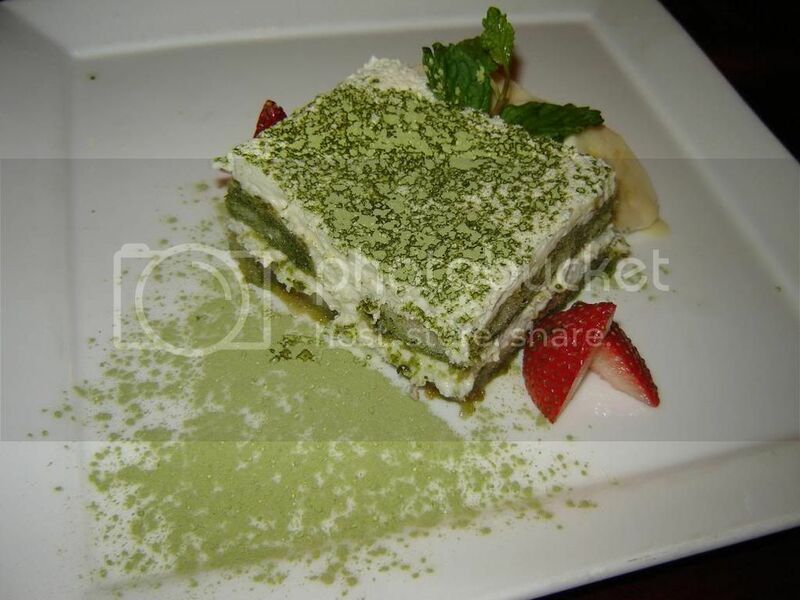 We had the green tea tiramisu for dessert. Really liked the taste, and the cream was excellent. The only down side was that in certain parts there were no ladyfingers and just cream, so we couldn't really eat it.